Industrial curtains are used to cordon off a workspace from the rest of the work area. The purpose of this can be to contain water, or even noise in the smaller space. Another use can be to keep cold air in with a refrigeration unit or to cordon off a welding area. Air barriers: they are often placed between buildings. They save energy because they do not allow hot or cold air to escape from the area and at the same time do not allow air to come in. Industrial curtains of this type can also cordon off a smaller area within a room that needs to be temperature controlled. Welding blankets: when you are doing a welding job there are sparks and molten metal pieces flying around. You want to protect the rest of the work area from the damage that could ensue from this flying debris. An example of this can be a garage. You might be doing some welding where there are inflammable chemicals being used. In order to prevent accidents and fires you will need to cordon off the area where you are doing the welding. 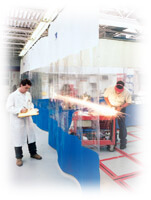 The industrial curtains for this purpose are often called a welding blanket. Warehouse dividers: these dividers are used in large warehouses. They will contain areas that you are using and cordon them off from the larger warehouse area. The purpose of this is to save energy because you do not have to heat or cool a huge area, you will just heat or cool the small contained area. You can easily put them up or take them down according to production needs. These types of industrial curtains can also come with wheels that will enable you to move them to different areas if you need to expand or contract the area you are using. Protection barriers: when tools or areas of a building need to be cleaned by strong water jets like a pressure washer these barriers can be useful for protecting other areas from water and debris. You can get see through barriers made of clear heavy duty plastic, so that you can get light into the area while still getting protection. This is useful for manufacturing areas. You can also protect areas from hazardous chemicals with these types of industrial curtains. As you can see there are many ways you can use these barriers. They are easy to install and very economical. They can also save you money on energy bills. Pressure washer safety workplace tips to prevent an accident from the high pressure water that comes out.